The TPS3808Gxx-Q1 microprocessor supervisory circuits monitor system voltages from 0.4 Vto 5 V, asserting an open-drain RESET signal when the SENSE voltage dropsbelow a preset threshold or when the manual reset (MR) pin drops to a logiclow. The RESET output remains low for the user-adjustable delay time afterthe SENSE voltage and MR return above their thresholds. 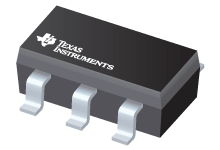 The TPS3808Gxx-Q1 device uses a precision reference to achieve 0.5% threshold accuracyfor VIT ≤ 3.3 V. The reset delay time can be set to 20 ms by disconnectingthe CT pin, 300 ms by connecting the CT pin toVDD using a resistor, or can be user-adjusted from 1.25 ms to 10 s byconnecting the CT pin to an external capacitor. The TPS3808Gxx-Q1 has a verylow typical quiescent current of 2.4 µA, so it is well suited for battery-powered applications. Thedevice is available in a small SOT-23 package (one option available in WSON) and is fully specifiedover a temperature range of –40°C to +125°C (TJ). For more information about TIs voltage supervisor portfolio, visit theSupervisor andReset IC Overview Page page.